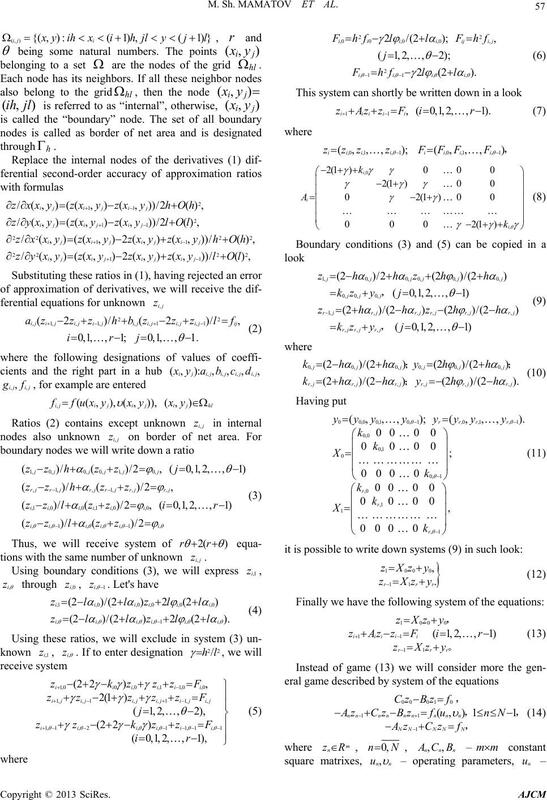 nite-difference method is used to solve this problem. lumped-parameter systems were developed in detail. 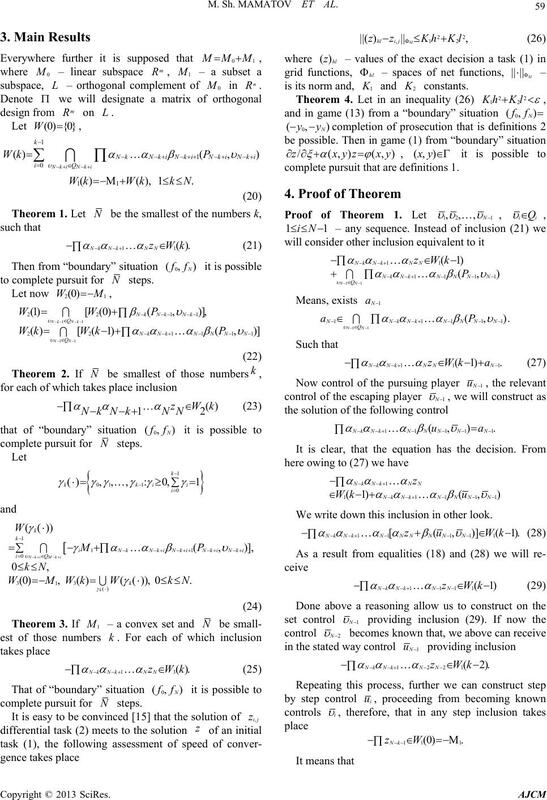 tions with the same number of unknown . M. Sh. MAMATOV ET AL. ficients in any field of any number of dim ensions [3-14].  – a vector of dimension m.
described by system of th e equations (17), (18), (19). takes place, there are return to the . 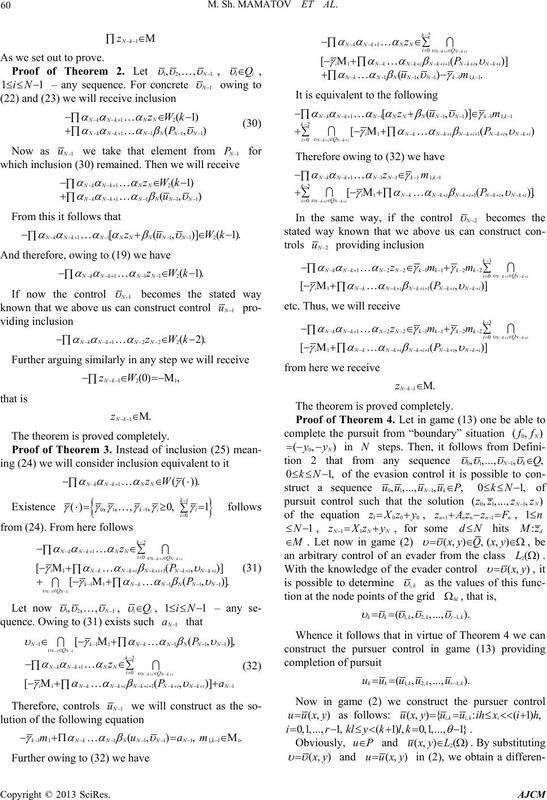 The proof of the lemma is complete. to complete pursuit for N steps. complete pursuit for N steps. complete pursuit that are definitions 1. We write down this inclusion in other look. As we set out to prove. The theorem is proved completely. O. A. Ladyzhenskaya, V. A. Solonnikov and N. N.
tions of Parabolic Type), Moscow, Nauka, 1967. SSSR, Vol. 226, No. 6, 1976, pp. 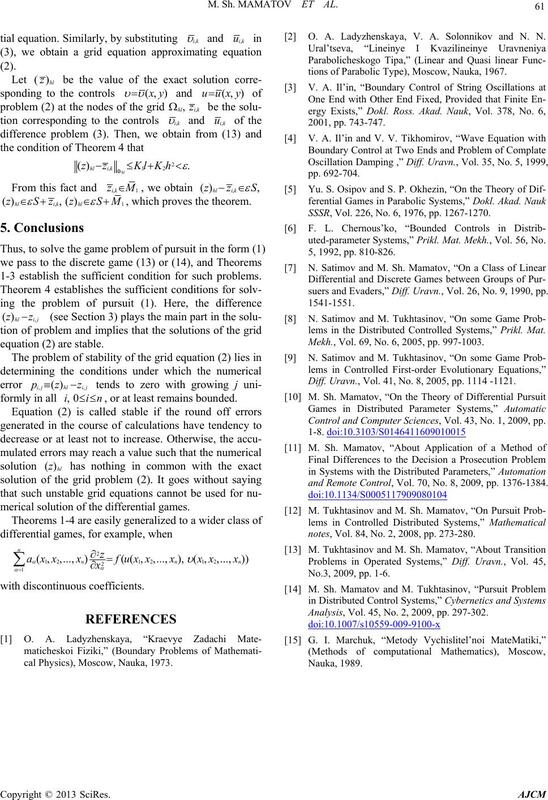 1267-1270.
, which proves the theorem. uted-parameter Systems,” Prikl. Mat. Mekh., Vol. 56, No. 1-3 establish the sufficient condition for such problems. suers and Evaders,” Diff. Uravn., Vol. 26, No. 9, 1990, pp. lems in the Distributed Controlled Systems,” Prikl. Mat. Mekh., Vol. 69, No. 6, 2005, pp. 997-1003.
formly in all , or at least remains bounded. Diff. Uravn., Vol. 41, No. 8, 2005, pp. 1114 -1121. 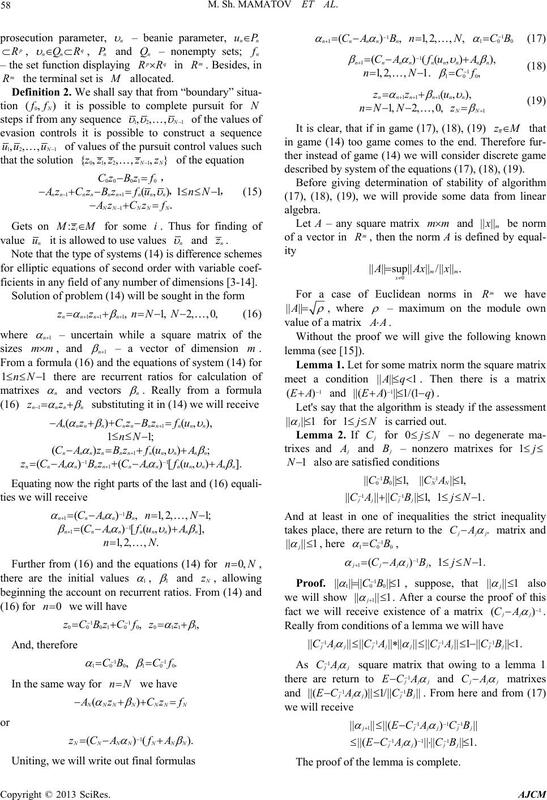 Control and Computer Sciences, Vol. 43, No. 1, 2009, pp. 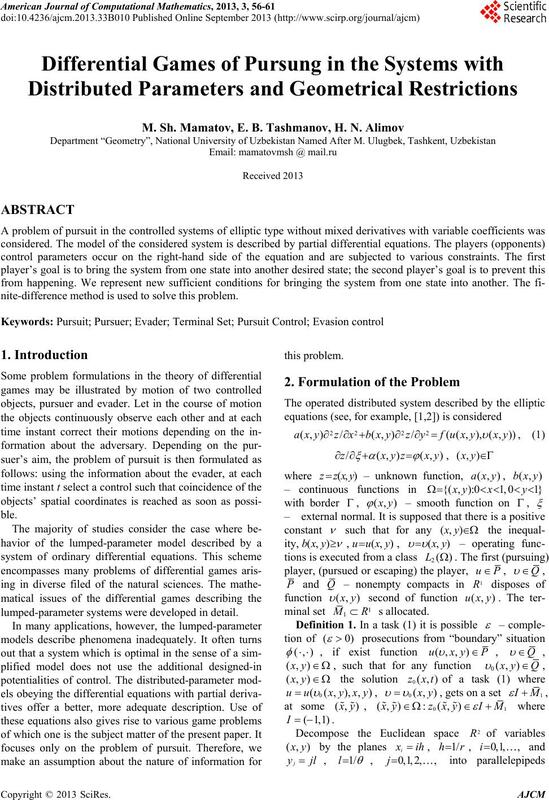 merical solution of the differential games. and Remote Control, Vol. 70, No. 8, 2009, pp. 1376-1384.
notes, Vol. 84, No. 2, 2008, pp. 273-280. Analysis, Vol. 45, No. 2, 2009, pp. 297-302.
cal Physics), Moscow, Nauka, 1973.